Fully aware of the Nostradamus effect and every “cognitive fallacy” under the sun, Decision Science News does have to hand it to Nassim Taleb for warning about the domino effect we’re now seeing in banking. Globalization creates interlocking fragility, while reducing volatility and giving the appearance of stability. 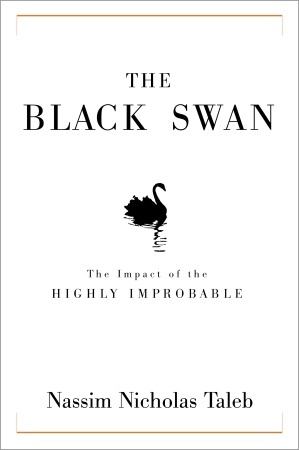 In other words it creates devastating Black Swans. We have never lived before under the threat of a global collapse. Financial Institutions have been merging into a smaller number of very large banks. Almost all banks are interrelated. So the financial ecology is swelling into gigantic, incestuous, bureaucratic banks – when one fails, they all fall. The increased concentration among banks seems to have the effect of making financial crisis less likely, but when they happen they are more global in scale and hit us very hard. We have moved from a diversified ecology of small banks, with varied lending policies, to a more homogeneous framework of firms that all resemble one another. True, we now have fewer failures, but when they occur … I shiver at the thought.” From Taleb, N. N. (2006). The Black Swan. Our current crisis is similar, in one respect, to the problem of portfolio insurance in the late 80’s. Replace “portfolio insurance” with “bond default insurance” and you see the similarities. When the stock market fell, and everyone wanted to exit according to their insurance models, they had to sell. Repeat and rinse. When the credit market, in its gloomy darkness, tanked for some bond issuers, those who provided insurance for the default had to sell assets, further lowering the value of the reserves held by other bond issuers. This problem will get sorted out, but the overhang of producing too much housing creates externalities that will take much longer to deal with because the Special Purpose Vehicles which hold a lot of these mortgages are designed as trusts – meaning that the trustee is bound by law not to rejig the mortgage commitments. Oops, bad idea. Thanks for the excerpt. I rather enjoyed re reading the black swan this past summer. I have already posted your excerpt on my website as well as Mr. Talebs talk to LongNow.org. If you get a chance please take a look at my website. I highly value your opinion. As a technology professional, I have to agree with the idea of global fragility. If someone could bring down the root servers (Domain Name Server), the internet would collapse. There are less than 30 of these root servers. It is scary to think that the internet is dependent on so few servers. As a practicing manufacturing engineer, I can attest to the idea of global fragility by comparison of a complex closed loop system. Whenever there is some sort of disruption on one of the sub-systems, the over all process feels the impact, albeit to differing degrees. The current fiscal problem is affecting manufacturing, service, energy, mining/natural resource sectors to name a few. Does globalization create interlocking fragility? was written on October 8, 2008 and filed in Books.